anyway... this well needed break has given me time to get some things out of the way and the chance to not do others... but after making a bit of a hash of the project on the last day (due to printing difficulties) I'm now going to catch up on adding my research to my blog (then I'll add up the pieces of work I made too) and although I doubt it will now affect my mark anymore, it needs to be done for my own closure. After our own Moon the next closest sources for water (in ice form) are still within our Solar system and not some distant planet in a galaxy far, far away. Space exploration has fallen down the back of the sofa of society, forgotten about except by those with an interest in it or until theres some discover that can benefit the human race. (i'm kind of going off on a tangent here, whether its to add cause to my research on water in space or just because I'm feeling a little defensive about space exploration). A few years ago, our interest was firmly set on Mars and discovering the hidden water on it's surface, from the ice layer beneath the soil, the believed liquid water flowing and carving it's way through the Martian landscape and the idea that Mars once held oceans. The NASA Phoenix Mars Lander has given us the most extensive evidence of water on Mars from the images and data it has sent back from the planet's surface. Evidence of ice can be seen in its own tracks across the surface but it has also collected video of snow falling from the clouds on Mars. 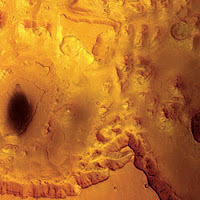 This article from New Scientist ( http://www.newscientist.com/article/dn10740-water-flows-on-mars-before-our-very-eyes.html or the original NASA article: http://www.nasa.gov/mission_pages/mars/news/mgs-20061206.html ) shows evidence of the changing landscape on Mars due to flowing water escaping from beneath its surface. Some believe it is merely the result of dust storms eroding away at the sides of the craters but when looking at Discover magazine's article on the evidence that Mars held oceans ( http://discovermagazine.com/2005/jan/nasa-rovers/?searchterm=water%20space ) you see carved rock similar to that of the Grand Canyon, where water has eroded down through the rock creating a valley/canyon and may have once held and channeled water on it's surface. This article (http://discovermagazine.com/2009/may/11-a-scientists-guide-to-finding-alien-life ), from Discover, interested me after I originally found out about the idea of a habitable zone in our solar system. Basically, since the big bang, our Sun has been expanding and growing hotter (which may mean global warming is not man made) but the heat given off of the Sun helps maintain water (h20) as a liquid on our planet, as well as allowing it to evaporate (but our atmosphere stops it all escaping completely and keeps the cycle going). could have once held water ( http://discovermagazine.com/2010/jan-feb/073 ) and supported life, but that Mars, Jupiter, Saturn and further may support life in the future if not at this very time but what will happen to Earth when this zone does shift? If the above is true though, then why is it that we believe that some of the Moon's of Jupiter and Saturn hold liquid water or in the case of Europa are completely covered in an ocean of water under a sheet of ice... These all fall outside of the habitable zone but at the same time we are only just at the point in history were we are exploring deeper into our Solar system. It may be 10 years before we head out to these "Moons" (i say moons as technically the are planets, but they are captured in the gravitational orbit of Jupiter much like our own moon), but I can't wait to see what is discovered.